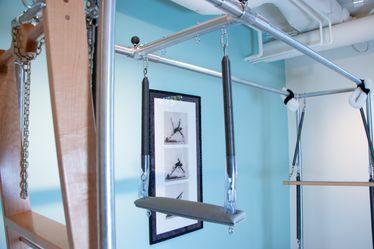 “The Arm Chair informs the rest of the workout,” said Andrea Maida, at her Solana Beach studio. The Arm Chair, also known fondly as the “Baby Chair,” or “Old Lady Chair,” wasn’t included as part of my contemporary Pilates trainings and I didn’t buy one for my new Gratz studio. I’d only seen it at Vintage Pilates and I had just recently read Andrea’s Blog on the Baby Chair. I was intrigued, and I wanted to find out more so I could give my view as a former contemporary instructor trying out this semi-obscure chair for the first time. So, I travelled from my home in Davis, California to take a lesson with Andrea to find out what the Arm Chair was all about. 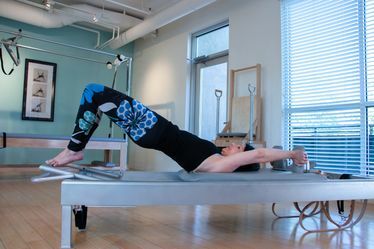 I originally wrote this for Pilates Intel (not posted as of 10/18). This is the long, unedited version. 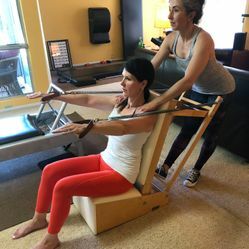 “The Arm Chair informs the rest of the workout” said Andrea Maida, when I visited her for my private session in her Solana Beach studio in August of 2018. The Arm Chair, also known fondly as the “Baby Chair,” or the “Old Lady Chair,” wasn’t in any of my contemporary Pilates trainings and I didn’t buy one for my new Gratz studio. I’d only seen one at Vintage Pilates in Los Angeles, and I had only recently read Andrea’s blog on the Arm Chair. I was intrigued, and I wanted to find out about the Arm Chair so I could write about it with Sunni from Going More Joe and give my view as a former contemporary Pilates instructor trying out this semi-obscure chair for the first time. 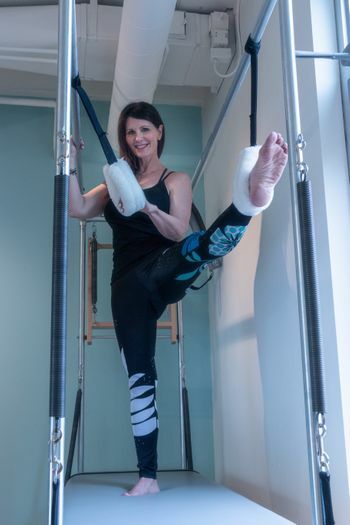 So I decided to travel from my home in Davis, California to take a two-hour private lesson with Andrea to find out what the Arm Chair was all about!